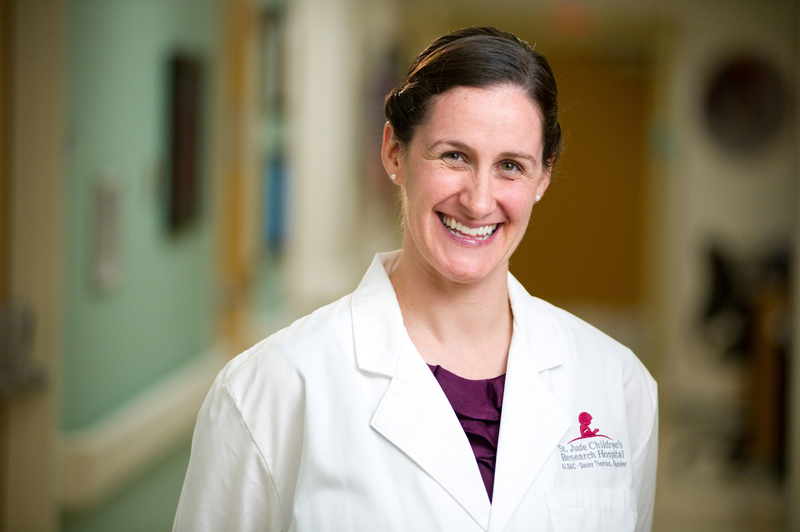 Dr. Brennan is a mom of one daughter and an assistant member of the St. Jude Faculty in the department of oncology, in Memphis, Tennessee. What’s your favorite parenting tip? Bedtime can be early. Even if my daughter doesn’t go right to sleep, she is still in her crib and can play quietly while Mommy and Daddy have a chance to reconnect, get ready for the next day, or just have some quiet time. And bedtime doesn’t mean tip-toeing around. Your baby will go to sleep even if you are doing the dishes. What has surprised you most about parenting? I needed to learn her “normal.” Everything you read in books or learn in school is just one way things can happen. Her milestones, attitude, likes/dislikes, reactions—everything is unique to her. Books and other moms (and your pediatrician!) can be a good sounding board and give great ideas, but at the end of the day, trust yourself as mom. How do you get you daughter to eat healthy food? Since her first solid foods, we have offered only healthy foods. We use sweets as an after-dinner treat a few times a week, so she doesn’t expect it after every meal or every day. She also loves to drink water, and she doesn’t drink juice. (We just never offered it.) At this age, we are very much in control of her eating habits, and we are trying to set good examples for the future. This means we also have to be careful about what we eat in front of her, which has helped us be more healthy too! How do you work exercise into your family’s life? We try to explore or take a short walk every night when I get home from work. If it is too hot or humid, we have a very active game of peek-a-boo (her current favorite) where she and I run around the living room/first floor to find different hiding places. She also loves to dance, so turning on the music channel and just tapping our toes or twirling around is fun. During the weekdays, we have a large yard she can run around and explore every bug, rock, and weed/flower. We also have memberships to the local zoo and botanic garden, and we visit each weekend. We are lucky that she loves to be outside and we use her wagon, her stroller, or our backpack to get around. How do you recharge your batteries? I have found time in each day—early morning or after my daughter goes to bed—to work out or to read. I have also started scrap-booking again—modified now that my craft room doubles as the guest room—but I combine an online book with hand-applied details for a personalized product. I get to work early to prepare for the day, which helps me feel in control of the hectic days. On my commute home, I have 25 minutes to listen to music and leave work behind as I get excited to see my family at home. If I need a pick-me-up during the day, I have a few videos of my daughter on my phone that I watch to make me smile and remind me that life is awesome.